In the dark, Darrel Aquino turns off the pump engine. The silence is a stark contrast to the noise of the gasoline motor and, before that, the piercing calls of the coqui frogs that met Aquino and his crew from the Maui Invasive Species Committee when they arrived hours earlier. They work together to pack up, rolling up fire hose by the light of headlamps before heading back to the baseyard. They’ll be back out the next day and the night after, but in a different area of Haiku as they work to stop the spread of the coqui frog. From dusk to dawn males call for mates, “Co-qui, co-qui.” The first note, “Co,” lets their competition (other male frogs) know they are there, and the “qui” is for the girls. As loud as a lawnmower or leaf blower, the calls drown out the sounds of a night in Hawaii: crickets, the night breeze rustling leaves, waves breaking along the coast. But while the ear-splitting call of this tiny tree frog is what they are famous for, problems with the coqui frog go beyond noise. Like us, these invasive frogs from Puerto Rico also find our island habitat and climate to be paradise. Coqui in Hawaii reach population densities greater than any terrestrial amphibian species elsewhere in the world. At over 20,000 frogs per acre in an environment that evolved without frogs, there is bound to be an impact. Karen Beard, Ph.D., a professor at Utah State University, and her students have studied coqui frogs in the islands for more than a decade. The interactions between invasive species from different parts of the world coming together in a new environment can be hard to predict, but her research is finding that the presence of coqui in Hawaii tends to benefit other introduced species — from invasive plants to nonnative birds to mongoose. Coqui frogs alter the way nutrients cycle in the ecosystem. The frogs feed on insects, mainly ants, roly-polies, cockroaches, and earthworms, but not mosquitoes. What goes in must come out and hundreds of thousands of invasive frogs contribute additional nitrogen and phosphorus to the soil. Though these additions help plants grow, the increase really only benefits introduced plants. The flora native to the Hawaiian Islands is adapted for nutrient-poor volcanic soils, so by increasing soil nutrients, the coqui frogs modify conditions to favor invasive plants, such as strawberry guava (native to Brazil). 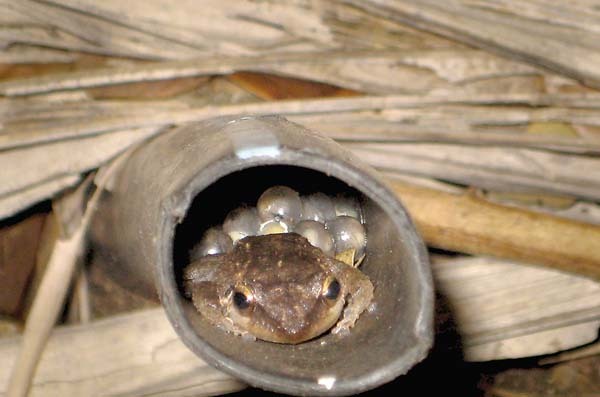 Coqui frogs also bolster populations of nonnative birds. Beard found that populations of some introduced songbirds, including common myna, Chinese hwamei and red-billed leiothrix (all from Asia), are higher where coqui frogs are present. This is likely due to changes in the insect community when coqui are present (more excrement and frog bodies means more flies) as well as birds consuming the eggs in addition to juvenile and adult coqui. Mongoose (from India) may also benefit from coqui. Beard’s graduate student Shane Hill looked at rat and mongoose densities where coqui are present compared to where they are absent and found greater mongoose abundance with coqui present. Mongoose are the main scavengers of coqui frogs, which may provide a novel food source. Hill also concluded that increased numbers of nonnative birds or coqui-induced habitat changes could favor mongoose. Hill’s study also showed fewer rats where coqui are present, more so for Pacific rats, which den underground as opposed to the more arboreal black rats. Hill and Beard suggest lower rat abundance could result from competition with coqui for insects or increased predation by mongoose. While the relationships are complex, one thing is clear: More mongoose is not good for ground-nesting birds, such as the uau kani (wedge-tailed shearwater) or endangered uau (Hawaiian petrel), and coqui could indirectly contribute to a decline in these birds. Humans may adapt to the noise of coqui but the environment may be forever changed by their presence; interactions among these invasive frogs and other introduced pests tends to compound the impacts. 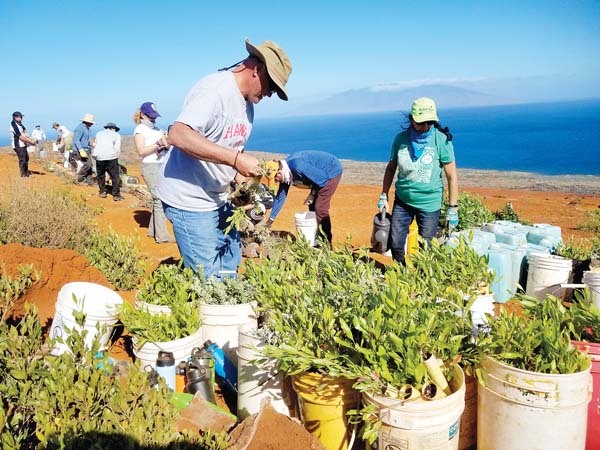 It’s critical to do what is possible to keep these invasive pests out of the native-dominated areas of Hawaii and sensitive bird habitat. You can help stop the spread of coqui on Maui. If you have coqui, volunteer in your neighborhood to reduce coqui and remove frog-friendly habitat. If you don’t have coqui in your area, stay alert to any nighttime “Co-qui” calls and report it to MISC at 573-6472.